COLUMBIA, Mo. 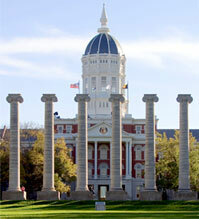 – The University of Missouri has Jesse Hall, Faurot Field, Memorial Union and the Columns. Now, MU has its own bug. An MU researcher has discovered a new insect on campus and given it a Mizzou name. Ben Puttler, assistant professor emeritus of plant sciences at the College of Agriculture, Food and Natural Resources, first discovered Aphis Mizzou in 2005 while conducting research on wasps on the MU campus. The insect, Aphis Mizzou, is a member of the aphid family of bugs. Aphids are tiny insects that live by feeding on the sap of plants. Nearly all annual and perennial plants, including shrubs and trees, are potential hosts for aphids. When feeding on these plants, aphids can crumple leaves, distort plant tissue and bend stems. There are 5,000 species of aphids known in the world, but only 150 live in North America. Puttler worked with Doris Lagos in the Department of Entomology at the University of Illinois to confirm that the insect had not been discovered previously. The bug’s uniqueness was confirmed by molecular tests at the University of Illinois. Puttler’s current research is focusing on the biological control of pests and how naturally occurring beneficial insects and other biotic agents can fight crop pests and weeds. However, the Aphis Mizzou doesn’t seem to be harming anything. It just wants to feed on the young leaves of the St. John’s Wort plant, Puttler said. Puttler has discovered six bugs prior to the discovery of the Aphis Mizzou, including one in which he named after his wife. Puttler said that most people won’t notice the Aphis Mizzou, as it is smaller than a grain of pepper.